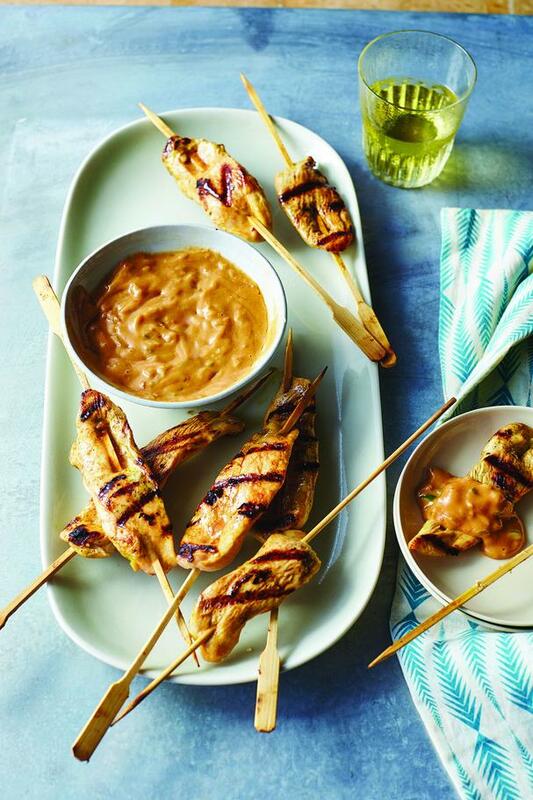 This rockin' good chicken satay recipe comes from Eddie Van Halen's former wife, actress Valerie Bertinelli, and is based on his mother's Gado Gado peanut sauce. It's deliciously spicy, garlicky, peanutty, and citrusy combined with the creamy goodness of coconut milk. This recipe is just one of over 100 tasty dishes featured in Bertinelli's new cookbook Valerie’s Home Cooking. Her easy and innovative recipes cover every meal of the day from Baked Brie with Almonds and Mango and Brown Sugar Sriracha Bacon Bites to Bacon Wrapped Jalapeño Shrimp with Cherry Cola Sauce and S’mores Popcorn. From breakfast dishes to sweet treats, you'll find inspiring meals to satiate friends and family alike. Make the Peanut Sauce: Heat the peanut oil in a small skillet or sauté pan over medium-low. Add the onion and jalapeño, and cook, stirring occasionally, until softened and fragrant, about 5 minutes. Add the garlic and ginger, and cook, stirring constantly, 30 seconds. Remove from the heat, and cool 3 minutes; transfer to a large bowl. Add the coconut milk, peanut butter, lime juice, chile paste, soy sauce, and fish sauce; whisk until smooth. Set aside. Make the Satay: Whisk together the coconut milk, vegetable oil, lime juice, brown sugar, soy sauce, fish sauce, ginger, curry powder, and garlic in a medium bowl. Cut each chicken breast on the diagonal into 6 strips. Place the chicken between 2 sheets of plastic wrap, and flatten to 1/4-inch thickness, using a rolling pin or flat side of a meat mallet. Place the chicken strips in a large ziplock freezer bag, and add the coconut milk mixture. Seal the bag, and turn to coat. Chill for 2 to 6 hours. Preheat a grill to medium-high (about 450°F). Remove the chicken from the marinade; discard the marinade. Thread 1 chicken strip onto each skewer. Grill, uncovered, until the chicken is cooked through and lightly charred in places, 2 to 3 minutes per side. Serve with the peanut sauce.